I'm sorry I'm so disorganized. I had hoped to post a fully thought out conclusion from my Winter Indoor Tomato Trial and maybe even offer to share seeds by mid July. But so far, all I've accomplished is to post my preliminary findings. From last year's experiment for which I started the seeds at beginning of September, several of us concluded that we would want to start the seeds by beginning of August to have ripe fruits by Christmas (mid to end of December). So I'm gong to start at least some of them -- probably too many -- and figure out later what will come inside and what can't. I have seeds drying but have not organized or inventoried them yet. But if anyone is interested, PM me and I'll see what I can do. I don't think I can send any more than 1/2 doz seeds per variety per person right now, though I should have more seeds later, after processing the fruits in the kitchen and freezer. If you have your own selection of tomato varieties to try growing this winter, I'd like to hear about it. Let's all keep each other updated and compare notes. I did not know u could so that! I didn't know you could do that either, without high intensity lighting etc., until applestar and gixx proved otherwise. I'm sure I've told people in the past that it isn't possible. Nonetheless, it isn't exactly easy. I'm not convinced enough to try it yet, sorry! Don't have south facing windows, the window space and lighting I do have is used up by all the trees and houseplants and stuff I bring in for the winter. Just not feeling manageable to me, though I admire you folks that are doing it. Admittedly I have not read all of the great into provided but I might try micro toms or something sound like a good place to start? I do not plan on growing any inside this winter but I do plan on growing some outside. My outdoor conditions will probably be pretty similar to your indoor ones though. Northern Fox.......I think I would like to try some tiny tomatoes I saved seeds from. It would be really nice to have winter tomatoes that actually taste like tomatoes. tomato fanatic like me here, I could eat them everyday, lots of them. Hopefully applestar will give us great instructions. Well, I said to myself, "If you don't start growing them, you'll regret not starting the seeds." Shadow Boxing -- Antho shoulder red saladette? globe? Utyonok (Little Duckling) -- yellow pointed cherry? I have a few more that I want to start seeds for tomorrow. These will be pink or dark, large fruited, productive great flavor varieties that I might want to sacrifice size for. Do I really have room to grow all these inside this winter? -- absolutely not. But I WILL have a selection of plants to choose from and won't be saying, "If ony I had started some seeds back then...."
under lights? I'm just going for grape size tomatoes or a bit bigger. Thanks. What I'm going to do is start them inside (in the garage) until they start sprouting so I can keep an eye on them. If I feel like I can go out to check them regularly (i.e. twice a day), I'll put them outside on the patio table or something. Otherwise (and more likely), I'll probably just turn on one of my seed starting area lights in the garage. I think they need to be babied until true leaves grow and they are Uppotted. Here, it will continue to be hot during August and early September, so I would keep them in part shade (shaded from noonday sun) and try to uppot to their final size containers without letting them outgrow their initial smaller containers and stressing them. I won't bring them inside until temps fall below mid-50's. I may (or may not) bring them in and out while temperatures stay warm during the day. Doing this worked well last year. It would help to acclimate them to the indoor conditions especially since I would then be keeping them on the patio which a sheltered area that only gets mid day sun. While they are out there, think about where you can put your plants in the house. Ideally, put them in a sunny window and provide supplemental light. Take a look at/review my last winter's thread I linked above. I described about several different lighting methods I used and posted photos. One step ahead of you Apple. Dropped these on July 27th. They are new crosses that need work. One is an F2 we are trying to capture the dwarf. I will be doing basically what you stated. Starting inside and bringing them out till the last possible moment than bringing them in for the winter. I will probably even put a few in the garden to see if they can produce before frost. I won't be growing as many this year (yeah right ). I want to concentrate on only advancing crosses. Utyonok is a saladette and in my eyes it's orange, did you get that description from Tat's? Shadow Boxing is striped with antho not solid red. Rainbow Dwarf is more of a white with clear skin and a blush on the bottom. Cherokee Tiger Stripe PLUM F6 is a plum. The Striped Plum looks and taste almost identical to Cherokee Tiger Black which is a saladette on a chartreuse plant. I had a plan to plant tomato seeds first day of August but I missed my deadline too. I have a lot of tomato seeds saved so I don't really need any. I learned a cool trick. I pick a tomato from the garden then save a few seeds when I slice the tomato. Wash the seeds in a tea strainer in water then plant them directly in the garden soil. I will have 2 inch tall plants in about 2 days. I will have tomatoes in about 65 days. I worked on cleaning my garden yesterday to start a new winter garden. I am going plant every thing directly in the garden and hope for the best. Cold weather might kill it in Jan of Feb no big deal I can plant a new garden again in March. Maybe temperature won't get below freezing this year. applestar...... What kind of soil and fertilizer do you use? If I only wanted about 6 tomato plants, could I just plant them in a bigger pot right away? Then up size them later? I'm so excited to hear about your indoor plants apple! I read all about you adventure last year and I was hoping I could find something on it this year! I have some black krim, Roma, and another variety that is something like zebra. 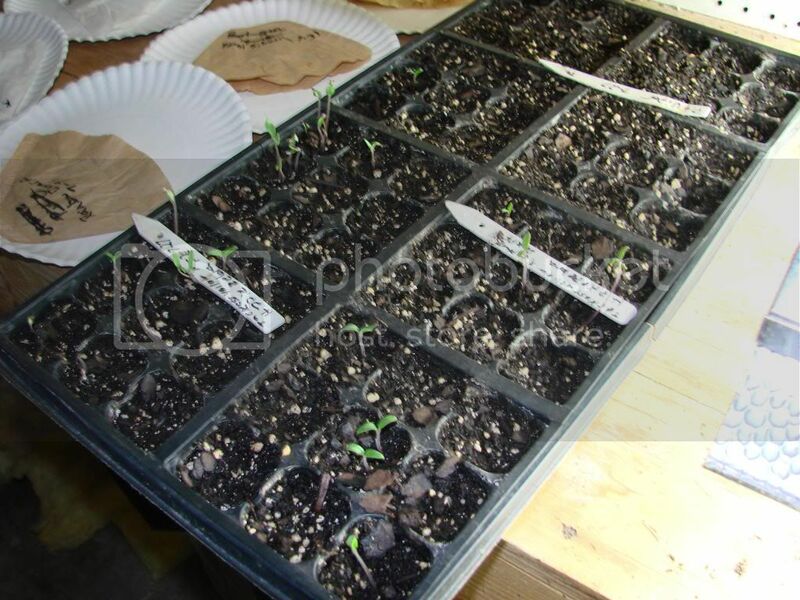 I started these seeds awhile ago (maybe a month or month and a half) and I never transplanted them. So, they aren't that big. Got some more pots and soil at agway today! So I reported about 5. I also did that to my super sauce! I hope it produces! Maybe it's too late but it's worth a try. Do you think a super sauce would be too big to bring indoors? Do the smaller tomatoes tend to do better or does it not really matter if space is not an issue (it kind of is but I have flexibility). Also, would it be bad to not use a light? And just try to keep it by the sun indoors (maybe taking it out for a play date every once in awhile when the weather is nice)? When I mix my own container soil, I mix about 2:2:1 topsoil:compost:sand and add some lime, greensand, rock phosphate, alfalfa pellets... Some shredded composted mulch. Unless you can bring in a 10-15 gal container you probably don't want to try to grow larger indeterminate varieties. You do need sufficient light and supplemental light for the sides away from the window and for lower foliage which is shaded as they grow. applestar......Thank you, I would only be growing cherry type tomatoes. Don't have room for the big ones. I would love to have a greenhouse or sunroom, where I could grow them all winter. The weather is so awful here, that you really can't grow much. Especially this year, have had nothing but thunderstorms almost everyday. Plus high winds and often hail.